These words, which form the beginning of the Ve'ahavta prayer, teach us that love of God and learning are closely related. The education of a Jewish child is a joint venture, shared by both family and the Jewish community. Children begin to build their Jewish identity by what they experience at home. Certainly, for the very young, the most effective teacher of Torah is the parent. One's basic values and attitudes towards life are acquired in the home. While parents are our first teachers, there will be many other teachers in our lives, and Judaism accords them special honor. Learning and scholarship are supremely valued in the Jewish tradition. Most children receive their formal Jewish education in a synagogue religious school, attending after school and/or weekend classes. In these classes, children study Hebrew, Bible, and Jewish history. They celebrate Jewish holidays and reinforce Jewish values. Students experience Jewish culture via art, music, dance, drama and literature. Every religion has ceremonies to mark rites of passage. 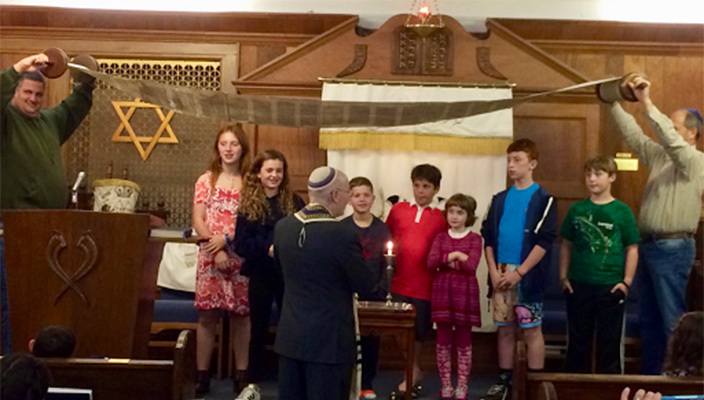 Ceremonies mark important learning milestones; Consecration marks the beginning of formal Jewish study, bar/bat mitzvah the entry into adolescence, and Confirmation the approach to adulthood. Consecration generally takes place at the beginning of kindergarten, or whenever a child begins his or her Jewish education. The ceremony is often held as part of the Simchat Torah celebration, though some synagogues may hold it at other times of the year. This is a lovely and meaningful ceremony for children and families alike. A large talit (prayer shawl) may be held over the students while they sing a song or recite the Sh'ma (the declaration of Jewish faith). The children are blessed by the clergy and are often given a certificate and a miniature Torah. How wonderful to being a child's Jewish education with a celebration.